We offer class A, B and C courses for your convenience. Once you pass our course, you will be able to immediately download and print your completion certificate. 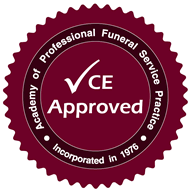 The following courses have been approved by the Arizona State Board of Funeral Directors and Embalmers.